Tata Motors recently won the order to supply at least 6,500/10,000 compact sedans to the Indian government-run EESL (Energy Efficiency Services Limited). Production of the car recently commenced at Tata Motors’ Sanand factory. 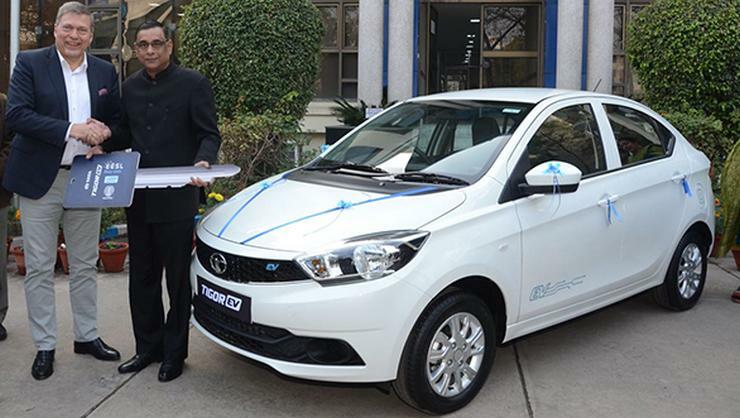 Now, the company has delivered the first batch of 350 Tigor electric sedans to EESL. Guenter Butschek, the CEO of Tata Motors, handed over the first Tigor EV to Saurabh Kumar, the MD of EESL. This initiative of the Government of India to procure 10,000 electric vehicles is a bold step in terms of promoting green & sustainable transport solutions. We, at Tata Motors are extremely proud to be part of this project and are supportive of the Government’s transformational vision of auto electrification in India. With Tigor EV, we have begun our journey in boosting e-mobility and will offer a full range of electric vehicles to the Indian customers. This tender has effectively paved way for connecting our aspirations in the e-mobility space with the vision of the Government. The Tigor Electric is a sub-4 meter compact sedan with seating for five adults. It is powered by an electric motor that produces 40 Bhp of peak power. It will have a range of 120-150 kilometers on a full charge. The batteries support a fast-charging method, which allows the batteries to charge up to 80 % in just 90 minutes. Tata Motors plans to offer the Tigor EV to private buyers in India if sufficient demand exists. Presently though, the car is meant only for the Indian government. Tata is now ready to build more electric cars such as the Nano EV and the Tigor EV. However, these cars – like the Tigor EV – will be built and sold to private car buyers in India only if there is enough demand. For now, the Nano EV is being built for Ola – an App-based cab aggregator – by a company called Jayem Automotive from Coimbatore. The Nano EV’s bodyshell will be supplied by Tata, and Jayem will add the electric powertrain, and sell the finished EV to Ola. The Nano EV has been branded the Neo EV.